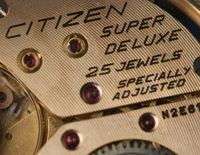 ……vintage Citizen watch parts are often hard to find, so finding hen’s teeth can sometimes seem more likely! 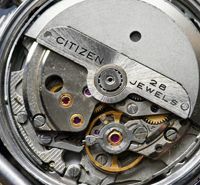 Many can be just about impossible to find, and this is something that puts collectors off since repair of worn out or damaged watches can simply be a non-starter. Occasionally though, and completely unexpectedly, parts do turn up. 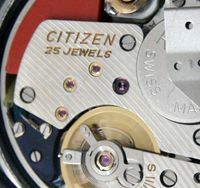 Now, technically this is not quite the correct part, since Citizen made this model with both the 52 and the 72 movements inside. The latter has a frame round the day/date window, whilst the 52 does not. So I’ll keep the old dial, but fit the new one since it makes the watch so much more wearable. Now I just need a new crystal for it……. 5 Responses to Like Hen’s Teeth….. I need a minute hand for my CROF 1501-Y, ridged type, can you help? Hi Ronald – nice to hear you have one of the Chronometers, is it a gold filled model? I don’t know the sizes for the hands I’m afraid – do you know what they are? 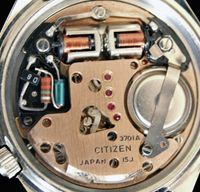 The 0400 movement is unique to the Chronometer so I don’t know what if any hands are inter-changeable. It may be possible to find hands on Yahoo Japan if the sizes match something else – the Jets for example, some of which used the ridged dagger style. 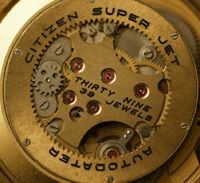 It is a gold filled, the length of the ridged dagger minute hand is about 18/19 mm. Hi Ronald – is your measurement from the center hole to the tip of the hand, or is it the total length of the hand?